Apparently, I've Been Domesticated: Got Spots on Your Squash Leaves? Try This DIY Natural Fungicide! 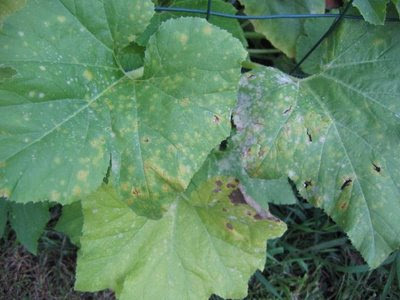 Got Spots on Your Squash Leaves? Try This DIY Natural Fungicide! So I called my mom, the only person I know that can eat any fruit or vegetable, stick it's seed or pit in the ground and have it magically grow. Mix together, then spray all the tops and undersides of the infected leaves. She also said to cut off all the yellow and dying leaves and the ones touching the ground. And to bag those leaves and throw them away. Do not compost them. Make sure you wash whatever you used to cut the limbs off. She said some other things, but now I don't remember. Here's a tip from me: wear gardening gloves and long sleeves, and whatever you do, don't try to break off the leaves with your unprotected hand. Holy crap! I have little splinter things all over my hands. One hurts so bad, it's killing me to type. Yeeowza. The not so horribly infected leaves looked almost immediately better. But the others were just eh. I figure I'll spray it on for the next couple of days and see how it goes. Next year, definitely mulching to stop all the weeds and trellises to keep the leaves off the ground. Perhaps even a spritz of this every week or so. UPDATE: So it's the morning after, and it appears that all the fungus, not counting a handful of leaves I missed, is completely gone! Except for underneath the leaves, which I did a crappy job of spraying, so there were still some spotting, but I sprayed them tonight. Cool, I think we all need this with the weather...this year. Thank you for posting this! It saved my squash and pumpkins! Tell your Mom I love the recipe! I think I'll have to reapply it a few times, but it already appears to be working! Good luck with your garden! Thanks for posting! Any chance this hurts the bees? Or other pollinating insects? I told my mom that people online said it worked for them and to thank her. She got a kick out of that! And then immediately went to tell my father, a chemist who likes to spray a litany of chemicals on their garden, that see! he should listen to her! Too funny... Happy Gardening, Everyone!